Hard News Cafe » Blog Archive » Aggie named best PR student in Utah—again! Aggie named best PR student in Utah—again! SALT LAKE CITY—It’s been a good year for JCOM senior Courtney Schoen Lewis, who was named the best public relations student in Utah on Monday—the second such honor for the Texas native in less than six months. 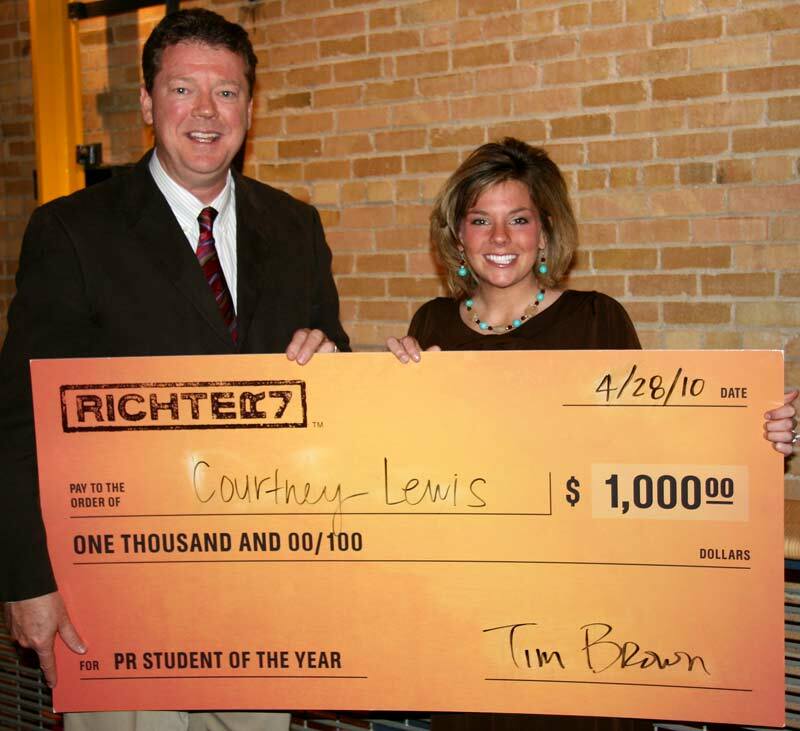 Richter7, a Salt Lake City-based advertising, public relations and digital marketing agency, named Lewis its 2010 PR Student of the Year after competition among students from the state’s colleges and universities. Lewis, president of USU’s Public Relations Student Society of America (PRSSA) chapter, also won the Golden Spike Award in November as Utah’s top PR student from the Salt Lake City PRSA professional chapter. This was the seventh year for the Richter7 competition, the oldest of its kind in the state. The honor comes with a $1,000 scholarship, which recognizes the Utah university student who demonstrates superior skill in communication and public relations. Lewis was selected for her professionalism, academic record and aptitude for success in public relations as demonstrated through a written case study and oral presentation, Brown said. Six finalists—including Lewis and fellow USU PR senior Lisa Janssen, plus students from Brigham Young University, Utah Valley University and Weber State—were selected from an original field of 16. The finalists’ task was to generate a hypothetical public relations plan with objectives, key messages, strategies, tactics and social media, which they presented to the Richter7 judges. USU PR instructors Troy Oldham and Preston Parker said they couldn’t be prouder. In addition to her studies and PRSSA activities, Lewis works part-time as a media relations assistant for the new Caine College of the Arts. Janssen, Lewis’s Aggie competitor, says she has no complaints about the outcome. Lewis said she felt confident giving a professional and creative presentation because her instructors have taught her well. “One aspect of the competition this year was presenting ideas on how to engage the media and increase news coverage,” she said. “I would not know how to make a PR campaign newsworthy if I not taken the pre-PR major courses like Media Smarts or News Writing. “My JCOM professors have taught me everything I know, but not everything they know,” Lewis said. Established in 1971, Richter7 has been named Utah’s “Best of State” advertising agency for the past six years and is consistently recognized for effective advertising, public relations, online interactive and design for local, regional and national clients.